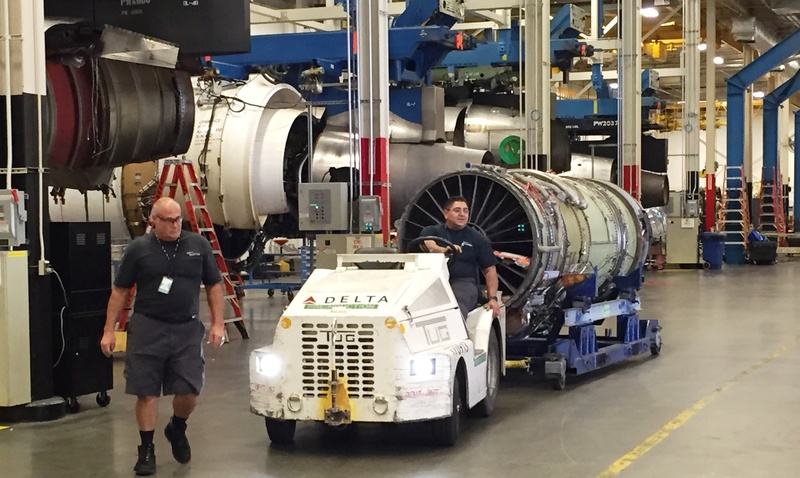 Delta uses billions of gallons of fuel a year, so it’s always looking to reduce its costs and cut emissions. Who’d have thought a coating for engine fan blades might help the airline accomplish those goals? The Operations Support and Enabling Technologies teams at Delta Technical Operations, working with MDS Coating Technologies (MCT), this week qualified for federal funding to further test a promising engine fan blade coating that is expected to reduce emissions, retain fuel efficiency, reduce maintenance costs and prolong the operating life of the JT8D-219 engine, the power behind Delta’s trusty narrow body workhorse airplane: the MD-88. Initial component level tests proved very promising, so the team had the idea to apply for funding under the second phase of the Federal Aviation Administration’s Continuous Lower Energy, Emissions and Noise program. Peiter says that the efficiency retention demonstrated in lab testing shows great promise in reducing Jet-A fuel burn and emissions per aircraft. And that potential, when applied to Delta’s fleet of 116 MD-88s, becomes very compelling, although testing phases will run for at least one year before any fleet-wide decisions are made. The MD-88 is an important aircraft for Delta, flying thousands of passengers on relatively short flights across the U.S. So what is the coating exactly? Well, the exact chemical structure of MCT’s BlackGold® coating is proprietary, but it appears as a shiny coating that bonds with the fan blade at the molecular level. Most fan blades made of titanium and cost tens of thousands of dollars, so the potential maintenance and part savings from protecting the fan blades with the BlackGold® coating could be significant.